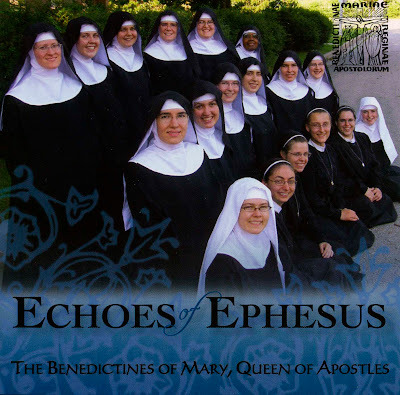 Kansas City - St. Joseph's own Benedictines of Mary, Queen of the Apostles have a new CD out titled "Echoes of Ephesus". This is a very young, rapidly growing and vibrant community which is trying to raise funds for a permanent Priory. The Benedcitines of Mary "pray and sacrifice in order that priests become more holy." They also make sacred vestments and when their Priory is built, will have a permanent place for priests to make retreats. There are 24 tracks on the CD including latin, traditional and original compositions by the sisters. The following is an excerpt from the track "My Mercy" which is an original composition by a Benedictine of Mary written for Bishop Robert Finn. "I asked our musician to try to write a piece that His Excellency could easily learn by rote," Mother Therese told the Key, "something to help him pray when he is burdened by the crush of the day." It was written for Bishop Finn on the 28th Anniversary of his ordination to the priesthood. It's both quite beautiful and "catchy". The CD is for sale at their website for $20. It makes an excellent Christmas present and also helps this community, very close to Bishop Finn's heart, build a permanent home. Following is excerpted from one of the Latin tracks on the album, "Domine Non Sum Dignus". The CD comes with all lyrics and English translation for the Latin pieces. Buy one now and then buy more for everyone on your Christmas list. They will appreciate it.